Safarp is a small and fast alternative to the Add or Remove Programs Control Panel applet. 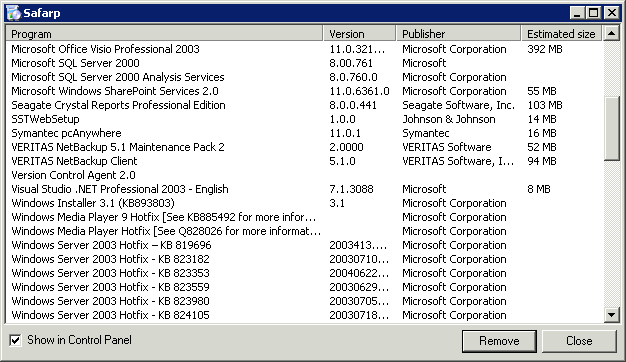 It displays a list of the installed programs and allows one to uninstall/repair them. Old but excellent program. It doesn't scan for leftover files and registry entries after a program's main uninstaller is complete (such as Your Uninstaller! 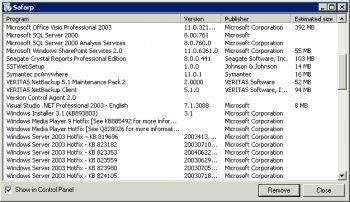 does), but as it stands it completely replaces the built-in Add/Remove Programs option of WinXP with a far faster alternative. Very small too. Lightweight and fast, Worksa as advertised. Only issue preventing a five out of five is that it does not uninstall JRE 1.6.0, or 1.6.0_0 properly. I tried MyUninstaller, as suggested in a previous poster's comment, to compare to Safarp. Safarp can also sort by columns other than the name, plus it loads MUCH quicker than MyUninstaller. Safarp is definitely the Add/Remove Programs replacement for me! but in my opinion this is better: http://www.nirsoft.net/utils/myuninst.html only 41 KB and more useful info (it's possible sort installed program by any field)!! Awesome job! A million times faster than then Windows control panel applet. On my machine it took Windows 1 minute and 20 seconds to list everything in the Add/Remove window, and Safarp took 0.235 seconds to list the same 303 items (at least that's what Safarp says, it happened too fast for me to even time it!) I haven't tried it yet but hopefully this program is portable as a straight EXE - it would make a handy addition to my USB flashdrive toolkit.